The Bishop of Wakefield, the Rt Rev Stephen Platten, will lead the commemoration. For further details telephone 01924 457057. The Brontë Parsonage Museum in Haworth, West Yorkshire has been stunned by news of two auctions in as many weeks, both featuring Brontë treasures of a kind that have not been seen at public auction in many years. 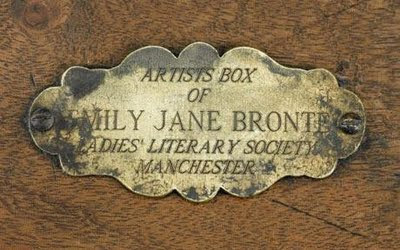 On 4 December, Christies in New York will host an auction of the William E Self library which includes numerous Brontë lots. The most significant of these is an extremely rare first edition of Emily’s only novel, Wuthering Heights. This is the copy owned by her sister Charlotte, who revised the novel for a new edition published after her sister’s death, and contains her pencilled-in corrections. There are also three lively letters from Charlotte Brontë to Henry Nussey, brother of her close friend Ellen Nussey. The letters include Charlotte’s reflections on family, work, the relationship between men and women, and marriage. One of the letters is Charlotte’s response to Nussey’s proposal of marriage. The sale also includes a miniature poetry manuscript produced in childhood by Charlotte. These lots alone are expected to fetch in the region of $280,000 or £170,000 and the museum is desperately trying to raise funds to ensure that these items are returned to a public collection in the UK and not lost to a private collector. It’s rare for such significant items to come onto the open market and there’s no doubt that these are items which are of such great significance to our cultural and artistic heritage that they should certainly be thought of as national treasures. It would be very sad indeed if these treasures were not repatriated or were lost to a private collection. We feel that these are things which belong here in Haworth and we’re appealing for people to get in touch if they can help us raise the funds to make sure this doesn’t happen. This will be followed on 17 December by an auction at Sotheby’s in London, which features items from the Law Collection and includes Charlotte’s mahogany writing desk, a pencil drawing by Emily, and an extremely rare surviving personal possession of Emily’s, her artist’s box and geometry set. As an independent charity the museum is constantly trying to raise funds to support its work, a fundamental part of which is seeking to acquire such important Brontë material and making it accessible to the public. Exciting news! 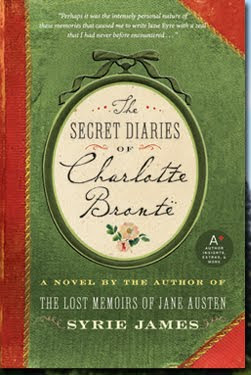 The Women’s National Book Association has named my novel, The Secret Diaries of Charlotte Brontë, one of the Great Group Reads of 2009. I am delighted because I truly believe that Charlotte’s story will open up lively discussions about a host of timely and provocative topics. The Secret Diaries of Charlotte Brontë, by Avon/HarperCollins Publishing in July 2009, is the result of many years of intense research and writing. As a devoted Brontë scholar, I was intrigued by how many of Charlotte's own life experiences found their way into her novels, and I found immense pleasure in bringing her true story to life on the page. The novel begins with an impassioned proposal from Charlotte’s father's curate, Arthur Bell Nicholls, who has carried a silent torch for Charlotte for more than seven years. Charlotte greatly disliked Mr Nicholls when they first met, but her feelings have evolved and changed over the years. Does she love him? Does she wish to marry him? Seeking answers, Charlotte takes up her pen to examine the truth about her life. In these pages, she exposes her deepest feelings and desires, her triumphs and shattering personal disappointments, her scandalous, secret passion for the man she can never have—the man who was the basis for all the heroes in her books, including Mr Rochester in Jane Eyre —and the intimate details of her compelling relationship with Mr Nicholls, the man she eventually comes to love with all her heart. At the same time, we learn of Charlotte’s relationship with her family, the inspiration behind their work, and their evolution as novelists. Although Charlotte and her sisters Emily and Anne did not have a single connection to the literary world, and lived in an era when women rarely saw their work in print — and despite their difficult circumstances at home, including an alcoholic brother and a father who was going blind — all three women became published authors at the same time. I cannot think of any other family in history who have achieved such an extraordinary feat, and I wanted to celebrate that and reveal how it happened. As part of my research I made an extended visit to the Brontë Parsonage Museum. I owe a debt of gratitude to Ann Dinsdale, the Collections Manager, for her gracious welcome to both the house and library, and to Sarah Laycock, the museum’s Library and Information Officer, for sharing many wonderful details about Charlotte’s clothing and other garments in the collection. I also was privileged to receive an unforgettable, attic-to-cellar tour of the former Roe Head School in Mirfield which Charlotte attended, which still sports the legend of a mysterious attic-dwelling ghost. A remarkable cache of new Brontë treasures have recently been donated the Brontë Parsonage Museum by a private owner living in Manitoba, Canada. The items were given to the museum by Mr Tony Hart, whose great grandfather was the nephew of Mary Anna Bell, the second wife of Arthur Bell Nicholls. Nicholls’ first marriage was to Charlotte Brontë and took place at Haworth Church in 1854, although Charlotte died the following year, possibly in the early stages of pregnancy. Mr Hart’s great grandfather emigrated from Ireland to Canada in the 1870s. The items donated all belonged to Charlotte Brontë and include a gold brooch set with garnets, a beautifully carved ivory visiting card case and card, a fragmentary manuscript by Charlotte, dated 1829 and entitled ‘Anecdotes of the Duke of Wellington’, an ink drawing of a ‘Wellington monument’ accompanying the manuscript, and a signed engraved portrait of Charlotte. The items would have been taken to Ireland by Arthur Bell Nicholls in 1861 after Charlotte’s death and may have been given to Mr Hart’s great grandfather as keepsakes. It’s very rare indeed for such a wonderful group of items to emerge under any circumstances, but we feel extremely fortunate and grateful to Mr Hart for donating what is certainly a very valuable collection indeed to the museum. Some of these items are quite unique within the context of the museum’s collection and so to have them return to Haworth after so many years, and all the way from Canada, is very special. The new items are now on display at the Brontë Parsonage Museum and can be seen along with many other treasures from the museum’s collection as part of an exhibition focusing on Charlotte Brontë. On Saturday 24th October 2009 at 5 p.m. 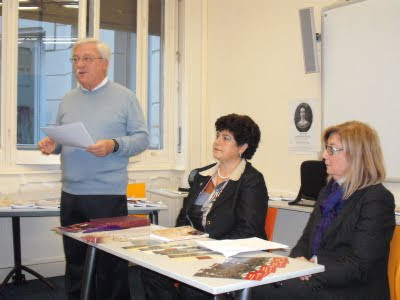 Professor Maddalena De Leo gave a talk at the British Council in Milan concerning her last publication, a first edition and translation in Italian of Charlotte Brontë’ novelette Henry Hastings. 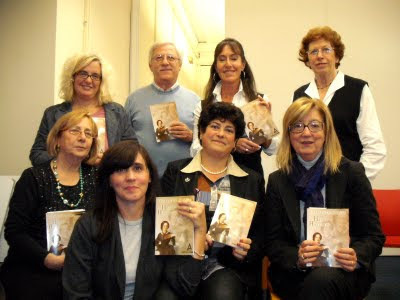 The event was organized by the Italian section of the Brontë Society and by Albusedizioni, the publisher of the nice little book. The public assembled in the historical seat of the British Council at Via Manzoni 38 had the pleasure to listen to Mrs. Franca Gollini, who introduced the editor and her work and to Mr Giuseppe Gambini, an Italian narrative writer, who spoke about the publishing House Albus and dramatized some famous moments in the book as the Prologue and Henry Hastings’s arrest. Professor De Leo then explained why she long ago had chosen to translate this particular tale by Charlotte by saying that it is extremely fascinating. Its main characters, just three, and the analysis of the already troublesome relationship between brother and sister are really puzzling for any Brontë lover. Moreover in the character of Elizabeth Hastings can already be found the germs for Charlotte’s mature heroines Jane Eyre and Lucy Snowe. The talk ended with a video reproducing some moments of the York Conference 2009 and the flowered moor at Haworth and, last but not least, a little party for all the people present. Maureen Peeck O'Toole's talk, Are you anybody, Miss Snowe? by focusing on the narrator Lucy Snowe and her relationship with us, the reader, addressed some of the questions that arise about this novel. Many of these relate to the character of Lucy. Can we like her, or at least understand her and feel sympathetic towards her? What is her attitude to us, the reader? Why does she sometimes seem to deliberately mislead us or at least withhold things from us? The talk was intended to be useful for first-time readers of the novel while suggesting new ways of approaching it to those already acquainted with it. The discussion that followed and comments by people who attended suggest that the audience did indeed find it thought-provoking. Maureen Peeck has lived in the Netherlands for much of her life and taught for many years at Utrecht University, but she was born Maureen O'Toole and brought up in Bradford close to the Brontë village, Haworth, which she visited as a child. Maureen is a founder member of the Brussels Bronte group and has always been one of its most active members.